Internal tipburn of cabbage can be an economic problem in the United States and northern Europe. Although this disorder probably has occurred to a limited extent for a long time, the incidence has become higher in recent years because of the more-intensive production practices currently used to obtain higher yields. White, red, and savoy cabbage are all affected. Tipburn is a nonpathogenic internal disorder that is associated with the death of leaf tissue, usually along the leaf margins in the interior of the head. At first the tissue turns tan or light brown, but later may appear to be dark brown or even black. The affected tissue loses moisture and takes on a papery appearance. The extent of the symptoms may vary from a narrow band along the leafmargin(s) of one or a few leaves to a rather extensive zone involving a number of leaves. The condition is not progressive, but does become increasingly evident as head maturity approaches. If an affected head is harvested at an early state of maturation, little evidence of the disorder may be observed. For this reason, fresh market cabbage does not as often show visible symptoms of tipburn as do more-mature processing cabbage heads. 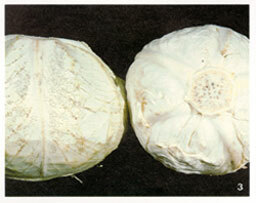 Affected tissue may be invaded by secondary pathogens (i.e., bacterial soft rot), which can cause further breakdown. Because tipburn cannot be detected externally, the head must be cut open to determine whether the disorder is present (see fig. 1). Tipburn was first described in 1946. Initially, it was thought that the problem was associated with excessive nitrogen fertilization, but soon it was determined that the disorder is caused by an inadequate supply of available calcium (Ca) in one or a group of leaves. The Ca-deficient plant cells collapse and die. The disorder can be caused by a lack of Ca in the soil, but usually tipburn results from the plant's inability to move sufficient Ca to the young, actively growing, inner head leaves at a critical point in their development. In a normal dailycycle, Ca moves with the transpiration stream to the outside leafy parts of the plant that are actively transpiring on sunny days. At night, especially when dew forms, transpiration by the leaves is reduced, and water movement generated by the roots (root pressure flow) is directed to the inner part of the head. On warm, dry nights the outer leaves continue to transpire, however, and the Ca is diverted away from the head. Once Ca is fixed by the outer leaves, it cannot be translocated to the interior of the head. Other stress factors besides prolonged nocturnal transpiration may also induce tipburn. Drought, water logging of the soil, root pruning, and similar stresses on the root system impair the plant's ability to absorb and translocate Ca to the young leaves within the head. An adequate supply of Ca in the soil will not prevent tipburn, nor has spraying with Ca been effective. Tipburn initiation is influenced by plant growth rate because the plant has a high demand for Ca during periods of rapid growth. High fertility, especially nitrogen, promotes rapid growth and, consequently, tipburn development. Well-drained soils with good structure encourage root growth and water and nutrient uptake. The maintenance of uniform soil moisture by supplementary irrigation during times of moisture stress may be beneficial. Perhaps the most promising control of tipburn is through the development of resistant varieties. Selection of varieties that have a high level of resistance is difficult, however, because it is impossible to adequately control the environment in the field during that period when susceptible leaves are being formed. Varieties must be evaluated for a number of seasons at several locations before the level of resistance can be reliably determined. To date no varieties have been developed that are completely immune to tipburn, but some varieties do have a high degree of tolerance. Black petiole or black midrib is an internal disorder of cabbage that has been occasionally noted in recent years. It was first described in New York in 1967. As heads approach maturity, the dorsal side of the internal leaf petioles or midribs turns dark gray or black at or near the point where the midrib attaches to the core. The.affected area may be quite limited or may extend for 2 or 3 inches along the midrib (see fig. 2). When leaves are examined under magnification, the cytoplasm in the parenchyma cells is found to have collapsed, turned dark, and hardened to the cell walls. Cells in the vascular bundles are found to be clear and free of discoloration. It is believed that this disorder is associated with a potassium (K)-phosphorus (P) imbalance and results when the K level in the soil is low and the P concentration high. High rates of nitrogen may contribute to the problem. Probably, as in the case with tipburn, black petiole is a complex physiological disorder in which environmental conditions play an important role in symptom expression. Variety evaluation trials have shown that there are differences in degree of susceptibility between varieties. Black petiole tends to become more evident when cabbage has been stored for a period of time. Pepper spot or black speck is yet. another nonparasitic disorder of cabbage. This disease, which was first described in 1919, is apparently quite widespread in the United States and in Europe. It occurs with varying severity on the outer leaves of the head, but often can be seen deep in the center of the head (see fig. 3). It usually becomes visible only after cabbage has been stored under cool conditions for a period of time. Development of individual specks, randomly distributed over the leaf, begins at the stomata on either side of the leaf. Necrotic breakdown of the guard cells is followed by a darkening and collapse of the adjacent leaf cells. Frequently, the necrotic areas coalesce, producing lesions as large as 2 mm in diameter. Although the cause is unknown, high rates of fertilizer, cultural conditions promoting vigorous growth, and temperature fluctuations have been reported to increase plant susceptibility. High rates of potassium in the soil have been shown to significantly reduce the severity of the disease. Varieties differ in degree of susceptibility, and some commercial varieties have an acceptable level of tolerance. Necrotic lesions similar in size to those of pepper spot sometimes occur on the surface of the leaf in the vicinity of the leaf midribs. This condition has been called vein streaking. Little is known about the cause of the problem. Observations indicate that the condition is eliminated or reduced in controlled-atmosphere (CA) storage. Some virus diseases have been shown to produce symptoms that are similar to pepper spot and vein streaking necrosis (see Cornell Cooperative Extension Fact Sheet, 153VCFS730.20, Virus Diseases of Crucifers). Necrotic spot is another lesion similar to pepper spot. Unlike pepper spot, groups of cells die simultaneously, and they are frequently associated with vascular tissue, rather than with stomata. In contrast to vein streaking, necrotic spot affects parenchyma cells; the epidermal cells appear unaffected. The result is small, sunken oval spots when they occur on the leaf. Necrotic spot is frequently seen on the outer side of the midrib or in the core, but it also can occur on the leaf blade. . The disorder usually develops during storage, with no visible signs at harvest. There are differences in susceptibility among varieties. Insusceptible varieties, necrotic spot becomes worse in CA storage than in refrigerated storage. This publication is issued to further Cooperative Extension work mandated by acts of Congress of May 8 and June 30, 1914. It was produced with the cooperation of the U.S. Department of Agriculture and Cornell Cooperative Extension, College of Agriculture and Life Sciences, College of Human Ecology, and College of Veterinary Medicine at Cornell University. Cornell Cooperative Extension provides equal program and employment opportunities. Lucinda A. Noble, Director.